By the time your child reaches 3 years old, he should be just about done with the behaviors that are characteristic of the "terrible 2s." Two-year-old children generally are self-centered. They dislike sharing, interact poorly with other children and lack self-control, empathy and social skills. Most 3-year-old children are capable of more self-control, independence and awareness of the needs of others. A 3-year-old child who is out of control and uncooperative needs help to learn more appropriate behaviors in a loving, supportive environment. Provide your child with simple, clear rules that are consistently enforced, which means you must stick to your decisions and not change your mind once your child begins to act out. This teaches her that tantrums are ineffective. Child-proof your home so that he can play and explore safely without breaking things or injuring himself. Putting away fragile items and designating play areas lessens the number of rules he has to remember and allows him to function without constant correction. Create and maintain a daily schedule for your 3-year-old. Children with undefined schedules often exhibit inappropriate behavior and have difficulty understanding what is expected of them. A consistent routine helps children feel safe and calm with less anxiety and stress. The schedule should include meals, naps and bedtime at the same time each day, but leave room for flexibility. Include different types of activities, quiet and active, to keep your child busy learning and doing. Remain calm when responding to your child's inappropriate behavior. 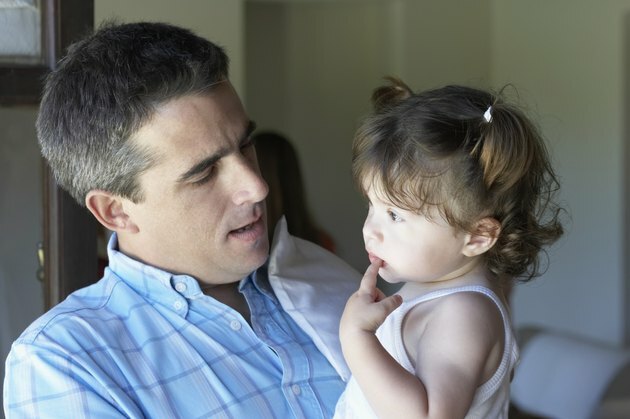 Your response – firm tone, no yelling and no demeaning language -- is critical to helping her to improve her behavior. Explain to your 3-year-old why his behavior is inappropriate and what the consequences are for the behavior. Apply timeouts as punishment. KidsHealth recommends using modified timeouts for 3-year-olds. Instead of specific time limits, end the timeout when your child has calmed himself so he has a better understanding of what self-control means. His timeout should not exceed three minutes, or one minute for each year of his age. Teach your child about self control by allowing her to see you respond to disappointments calmly. Talk to her about frustrating situations and let her help you find solutions. Encourage your 3-year-old to use words to express her anger or frustration. Improving her ability to express herself limits the need for tantrums. Reinforce the lessons you want your child to learn by using compliments and praise when he follows the rules, uses self-control in frustrating situation or exhibits kindness. Positive reinforcement encourages your child to behave appropriately, gives him the attention he needs and provides a supportive environment. Enforce the rules continuously and consistently. Discipline must be continuous to be effective, according to Healthy Children. Part of discipline is teaching and modeling appropriate behavior. Temper tantrums usually start when a child is 2 to 3 years old. Tantrums should start to taper off by the time a child is 4. Spanking or hitting your child teaches her that it is OK to hit someone when she is angry. Contact your pediatrician if your child’s aggressive behavior is unusually violent and the episodes are frequent or have occurred for more than a few weeks. Contact your pediatrician if you suspect your child might have developmental delays, which can result in anger, loss of control and poor social skills. Your doctor can direct you to resources that can help rule out hyperactivity or attention deficit hyperactivity disorder. What Can a Person Do for a Child With Insecurities?